One Direction might have thought they had done the hard bit by conquering America and creating the worst case of hormonal boy band frenzy since a bunch of 60s Scousers whose name escapes us. With great success comes great responsibility however, and the 1D boys have now been told to shape up ahead of their US tour. Record company Columbia didn't get to be a massive corporation without protecting their interests and there seems to have been some concern that once the sobbing girls of the Mid-West saw the lads up close they would realise that they were a quintet of scrawny English adolescents who pay far too much attention to their hair. The sensitive metrosexual look has never played well in middle America, so it looks like some Columbia exec has put out a sternly-worded memo instructing the boys to get a little more buff and masculine. One Direction didn't get where they are today without cringingly obeying every order from music business people, so have been subjecting themselves to a painful spot of mixed martial arts exertion. Not as painful as they deserve obviously, but hey it's a start. MMA trainers Mark Jarvis and Jimmy Wallhead have been enjoying every discerning music fan's dream job, subjecting the boy band to punishing boxing sessions, arduous circuit training and joyless low-carb diets. 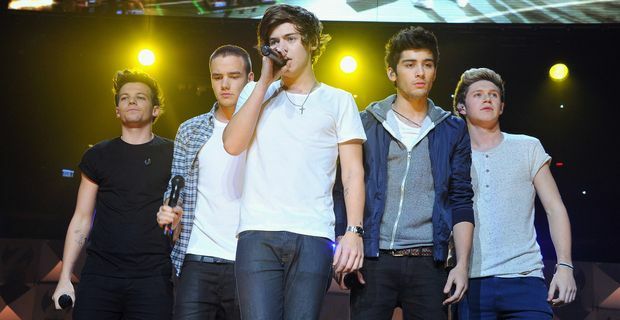 A 1D source told The Mirror: "It’s important for the boys to be in the best shape physically possible for these dates. The bosses don’t want half measures, and as the boys spend a lot of time travelling, there can be a tendency to eat junk food and play lots of video games." Shocking. It's totally unacceptable that One Direction should be allowed to behave like normal blokes their age. Instead, we are told "Harry has really bulked up his arms, and Liam has a sturdy set of abs."